On cut section of the lung, the dilated airspaces with emphysema are seen. Although there tends to be some scarring with time because of superimposed infections, the emphysematous process is one of loss of lung parenchyma, not fibrosis. Centrilobular (centriacinar): primarily the upper lobes. 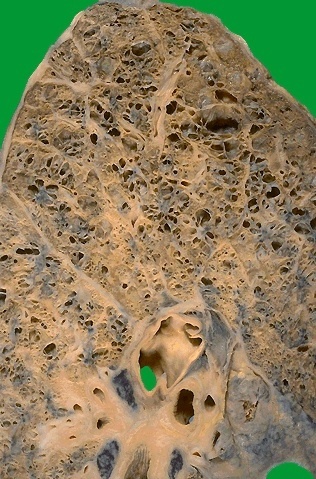 Occurs with loss of the respiratory bronchioles in the proximal portion of the acinus, with sparing of distal alveoli. This pattern is most typical for smokers. Panlobular (panacinar): involves all lung fields, particularly the bases. Occurs with loss of all portions of the acinus from the respiratory bronchiole to the alveoli. This pattern is typical for alpha-1-antitrypsin deficiency.